This is a splendid application that draws children into discovering all the fascinating things about their body in an engaging and funny way. Moving Books! 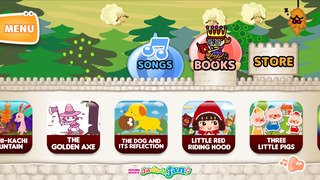 Jajajajan, is essentially a sing and read along application of Nursery Rhymes and Fairy Tales. The combination of text, moving graphics and song give it a chirpy feel designed to engage the child and help them memorise the words and relate to the story line. Back at the main start screen I chose the songs section and played the forever-popular “Mary Had A Little Lamb” nursery rhyme. After an initial delay for the data to be downloaded, (which enables off-line playing) displayed before you is a rather amusing interpretation of the rhyme, with bright coloured cartoon figures of Mary and some sheep dancing to the tune, sung rather earnestly by a young American girl and the words to the tune are displayed in sync with the song. The story unfolds with further brightly coloured graphics of the scenes and the teacher eventually expelling Mary for taking her little lamb to school. The songs section has a choice of twelve rhymes with the same generic delivery processes, some of which I am not familiar with but they are all as equally jolly. The book section contained nine books combining the familiar with the not so familiar. I clicked on the ‘Three Little Pigs’ book and the story unfolded with some simple but effective animations developed in a style of stick puppets, slightly amusing noise animations and narrated by an enthusiastic American lady. I enjoyed watching ‘Momotaro’ a story I was not familiar with. All stories and songs had links out to other applications that bore no relationship to the application and some of which were not age appropriate. My grandchildren, who are avid users of educational apps, were not engaged for very long in the songs or stories and I sensed that they needed a little more interaction with the story line to involve them for a longer period. This application has some amusing features and the concept of the programme is very good, however the substance and style would not rank it in my top ten toddler chart. and more. 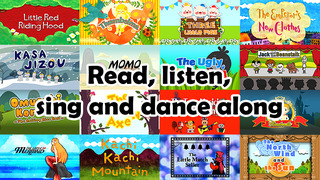 Watch, read, listen, dance and singalong. Prince Jajaja and his whimsical kingdom of characters are ready to help your kids learn and play. • Animated fairy tales and songs delivered right to your iPhone, iPad and iPod touch. There’s always time for a nursery rhyme. • In-app purchases can be synced across all devices with the same operating system. • Loads of fun at parties. Have a singalong. Works with AirPlay. • No advertisements, no social media integration & child-friendly interface. 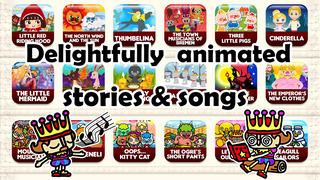 Traditional folktales, fables, bedtime stories and popular fairy tales come to life in delightfully animated scenes. Words appear on screen so your child can follow along. 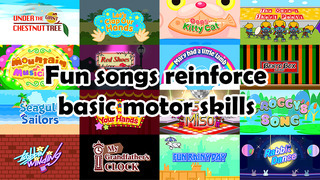 Sing along in a karaoke jam to animated children's songs such as “Let's Clap Our Hands” . Easy dance moves your little ones can quickly learn reinforce basic motor skills, self-expression, and communication skills. Note vocals cannot be switched off. All books and songs are produced exclusively for MOVING BOOKS! Jajajajan. If certain songs or stories cannot be viewed, there may have been an error when downloading the content. If the download/install button does not re-appear, please uninstall and then re-install this app. When the app is re-installed, the bookshelf on the Home screen may be reset, but any purchased content can be downloaded again for free by tapping the Restore icon ("i mark" at the bottom left corner of the Home screen). To use AirPlay, make sure AirPlay is ON, before launching the app. To watch videos full screen, please make sure mirroring is off.